Nippon Ichi Software have announced that their PS Vita dungeon RPG Coven and the Labyrinth of Refrain will be getting a PS4 port and will be launching in Japan on 28th September this year in both standard and limited editions. 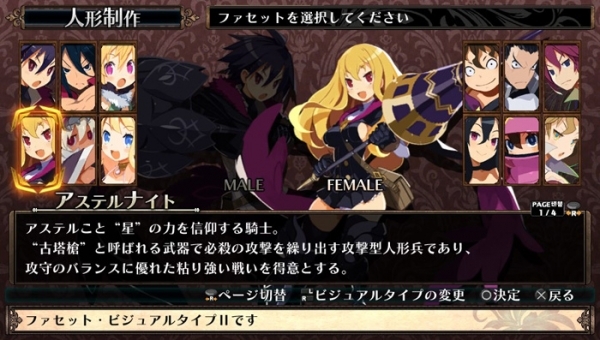 This version of the game is a straight port of the June 2016 PS Vita release aside from the addition of more “Facet Visuals.” For example, you can now pick three character portraits in your starting lineup instead of two (pictured above). “Facets” are the in-game name for classes in Coven and Labyrinth of Refrain. The limited edition will be reprint of the PS Vita version which will contain the game, a complete 2-disc soundtrack and tarot cards. Coven and Labyrinth of Refrain is currently avaiable on PS Vita in Japan.